WinX HD Video Converter Deluxe from Digiarty Software is a fast and powerful HD video converter tool that able to transform High Definition videos into all popular video formats for Windows operating system and mobile devices. With WinX HD Video Converter Deluxe, users can covert HD videos to standard video formats and enjoy up to 15x faster real-time video converting speed. In addition, WinX HD Video Converter Deluxe also comes with intuitive user-friendly interface, and supports more than 160 video codecs and 50 audio codecs, including multi-track High Definition videos such as BDAV, M2TS, MKV, AVCHD, HDTV and MPEG-TS formats. 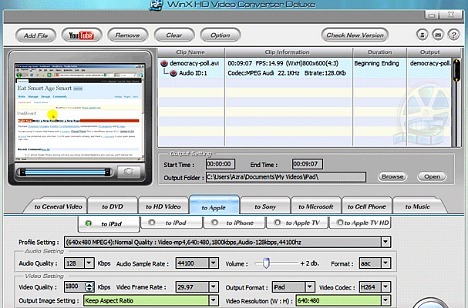 WinX HD Video Converter Deluxe normally cost $49.95 to purchase. As part of celebrating foundation of MacXDVD, Digiarty Software is now giving away free license code for WinX HD Video Converter Deluxe until 1st November 2010. To grab the free copy of HD Video Converter Deluxe, just follow the guide below. The steps is a kind of an SEO attempt. If you’re not comfortable in following steps, just scroll down to step 3 and 4 to directly access the WinX HD Video Converter Deluxe setup installer download links and the valid license serial key number. Alternatively, just grab the free WinX HD Video Converter Deluxe license key code given away earlier. Note: To avoid mistake, copy and paste the phrase, which is case insenstive. Users will find WinX associated link in the first one or two pages of search results. Click on it to access the WinX page. Install the WinX HD Video Converter Deluxe and enter the license code to enjoy free WinX HD Video Converter Deluxe. WinX HD Video Converter Deluxe supports Microsoft Windows 98, NT, 2000, 2003, XP, Vista, and Windows 7.